In April, Minneapolis-based photographer David Bowman’s wife and two teenage daughters headed to Florida for spring break. 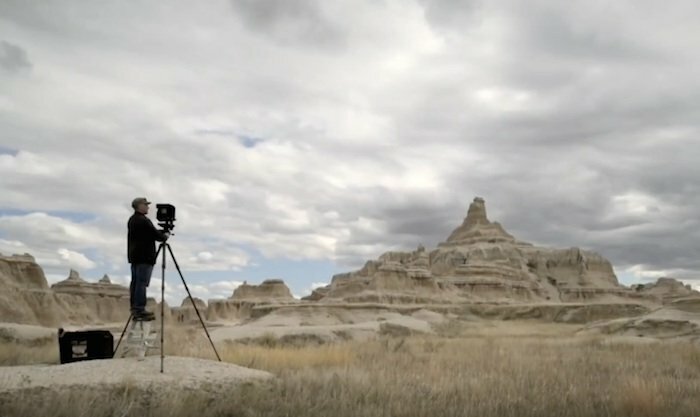 Bowman himself hopped in his car with a 4x5 camera and drove west to the Black Hills region of South Dakota. Bowman, whose work has appeared in Rolling Stone, Vanity Fair, Time, Glamour, National Geographic and in marketing campaigns for Johnson & Johnson, Ford Motor Co, and Disney, says he considers himself first and foremost a landscape photographer. During his trip to the Black Hills his love of craft led him to create a short film, American Landscape: Black Hills, which we feature today, along with Bowman’s behind-the-scenes account of making it. The short is an ode to large-format landscape photography and the place that lured him west this spring. “With so much empty space, it’s like pointing the camera into the void,” he notes in his film. I consider myself a landscape photographer first, but it can be difficult to peel myself away from the day-to-day hustle of shooting portrait assignments, since that’s my primary income. But the snow had just melted and the girls were going to be out of town for spring break, so it seemed like the perfect opportunity for me to get back outside and create a new landscape series. One of the biggest challenges for me in shooting open landscape like the Badlands is that it can be like pointing a camera into the void. With so much empty space, it can be tough to define form. And when everything looks about the same, how do you find a shot? A way around this problem is to keep searching until you discover one spot that you love, and then stay there all day. When shooting for myself, I typically dedicate a full day or more to making one still photograph. No one usually sees that side the image making, but it’s probably my favorite part: exploring new locations and standing still long enough to experience an entire day in one spot. By adding video to the mix, my goal was to get motion footage of me working with the large-format camera in the Black Hills, and to post these 10-second clips alongside the final photographs on social media. People are often surprised to learn how much time goes into the making of one photograph. It felt a little odd setting up two cameras: a big one pointing at the landscape and a smaller DSLR looking at me. It felt even funnier when a park ranger crept up from behind while I was shooting and asked to see my driver's license. He said he'd never seen anyone taking pictures like this before, and he figured it must be illegal. But after checking me for warrants and weapons — and collecting evidence by photographing my cameras with his cell phone — he let me go with a warning. Later that night in my hotel, I researched the park rules regarding photography and could not find any that I’d violated. The next morning I called the park and they apologized, saying that it was a learning experience for them. Another challenge in a project like this is how iconic the Black Hills landscape has become. Over the years I’ve seen so many pictures of Mount Rushmore that it has become surreal to me and feels more like something out of fiction. I'd never given it much thought. But I wanted to see it for myself and find out what it might look like on the ground glass of a 4x5 camera. For the film’s final shot, I drove 100 miles into Wyoming and explored Devils Tower, America’s first National Monument. It didn't disappoint. From the first moment I saw it on approach, rising like a menace above the landscape, it filled me with a sense of wonder and dread. Devils Tower is a fantastic, sublime and ominous place, and I had it all to myself: The perfect spot to land on the last night of my trip. I shot the still photos with my Sinar P2 4x5 camera, Gitzo tripod, and Phase One P45+ digital back. I captured the video at the same time with my Nikon D810 DSLR camera with 24mm tilt-shift lens and Bogen tripod. I processed the RAW files on my 2016 MacBook Pro with 5K LG monitor using Capture One Pro and Photoshop software. I edited the video on the same computer with Final Cut Pro X. When I shot the video, I didn't necessarily know that I was going to speed up the footage. It wasn't until I had finished working on the still images that I realized how effective a 10-second time-lapse clip could be to show the passage of time. Shooting video all day at 24fps did burn up a lot of memory, but it gave me the option of shifting into slower speeds while editing. David Elack commented on: June 4, 2017 at 7:30 p.m.
David, I may always regret not following the same career path as you. your parents have shared your work with m a number of times and I've enjoyed seeing the results of your efforts. I have been taking pictures for more than 60 years, but strictly on an amatuer basis I have been fortunate to be able to visit a great many foreign ountries, as well as Alaska and quite a few of the the other states. Any good pictures I may have acquired have been because the subjects were too spectacular or beautiful, or stunning, or just happened to be in the right place at the right time., or held still long enough for me to get through fumbling around. I envy you your profession and your talent. I don' know if your dad ever mentioned that one of our fraternity brothers, Boyd Norton is a wildlife photographer of some reknown and has published more than a dozen books and contributes to National Geographic and other similar publications. David Bowman commented on: June 9, 2017 at 7:45 p.m.
Great to meet you David Elack, and thanks for the info about Boyd Norton. Good to know!